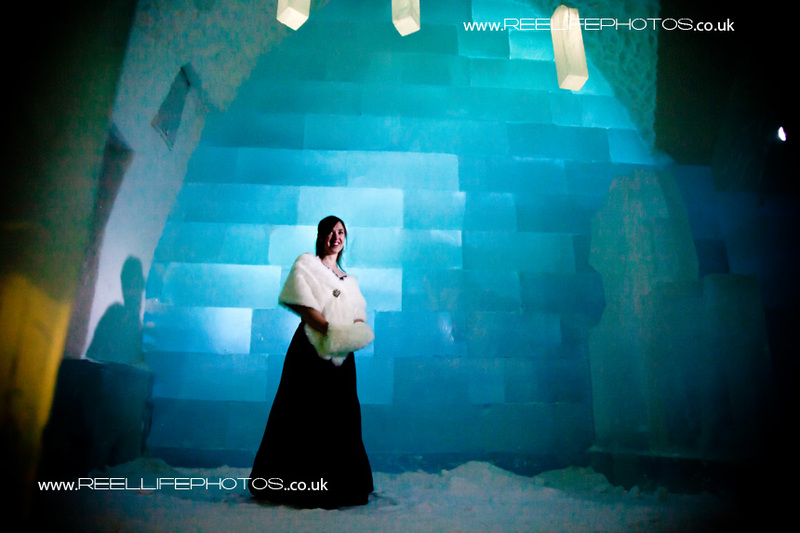 Almost ready...Mascara on ...then slipping into her wedding dress - with a bit of help ..
big smiles as Zoe is ready for her Ice Hotel wedding at last. Capes on, so its out to brave the bitter cold...brrrrrr! This is it! 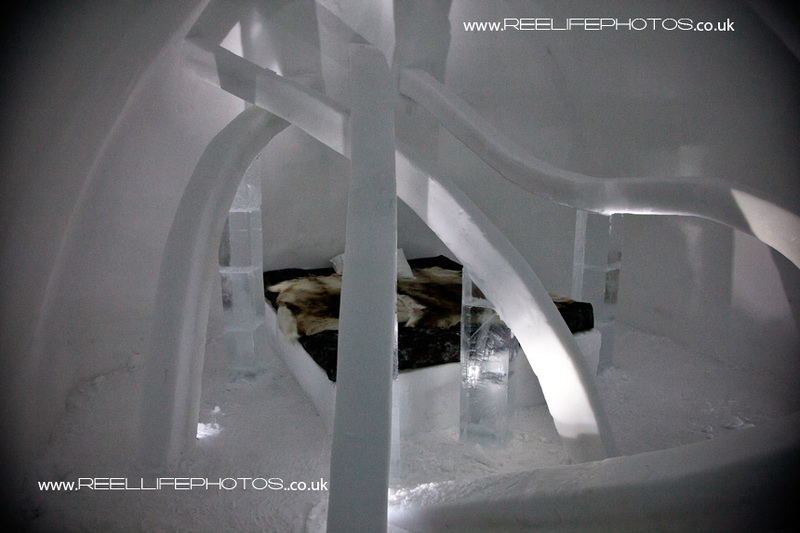 Minus 15 outside, minus 5 inside the Ice Hotel. 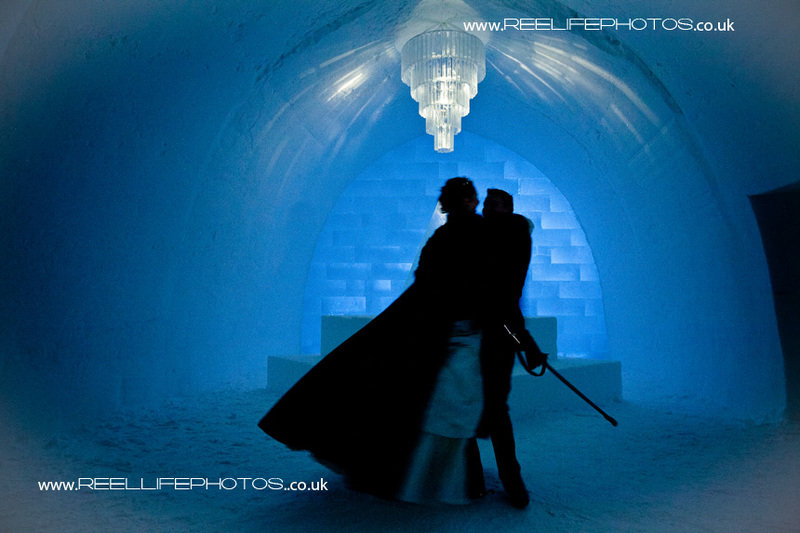 Ice Hotel Bride Zoe swishes her black cape as she walks past the Ice Hotel with her father at dusk and the groom inside the ice chapel awaits his bride. 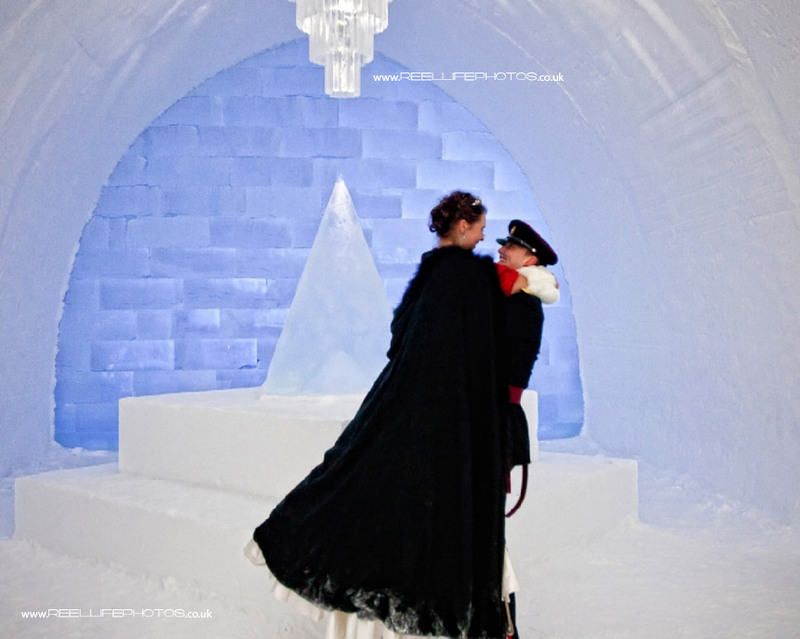 The elated couple kiss as Sami music reverberates throughout the Ice Chapel. 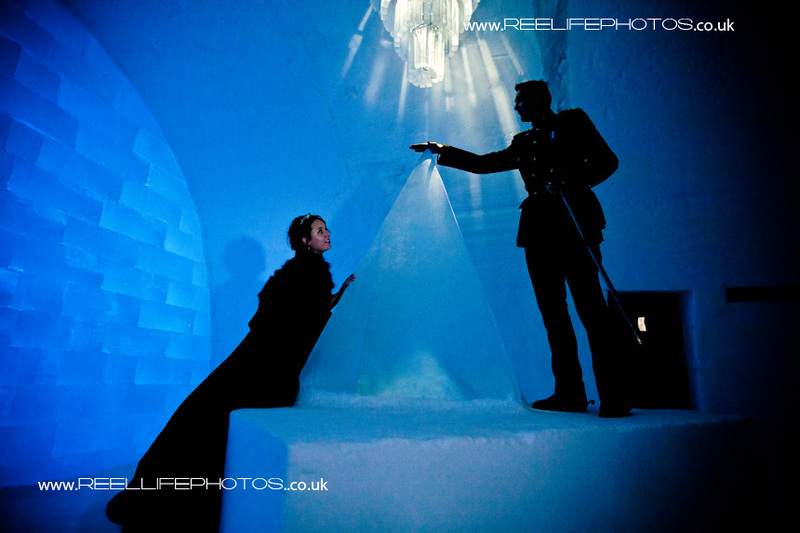 Soft light glows throughout, bringing the ice sculptures to life, echoing the couple's solemn vows, in harmony with the world. 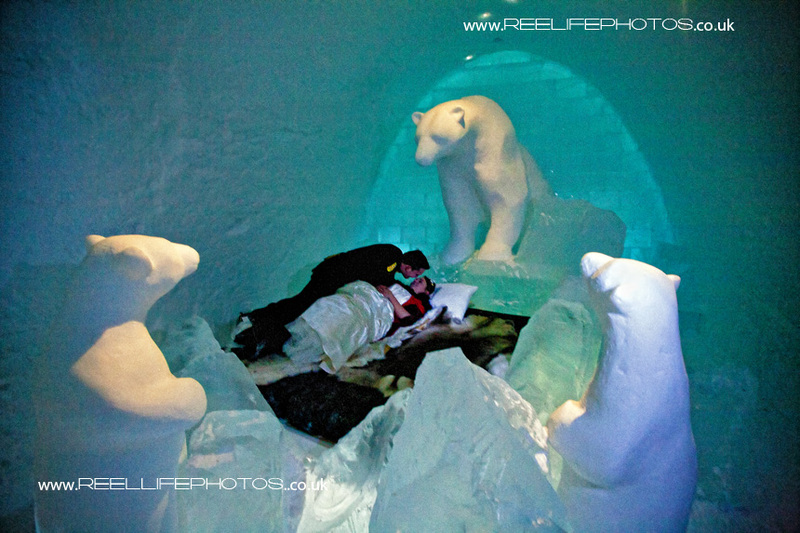 The Ice Hotel Chapel fill with warmth as kisses and hugs envelope the frozen families.. 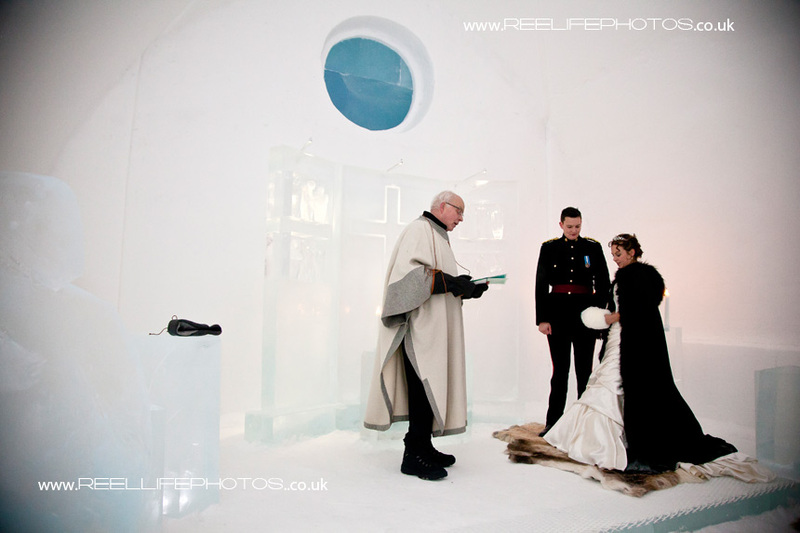 I can honestly say this is the first time I have photographed the throwing of the bouquet inside the Ice Chapel! 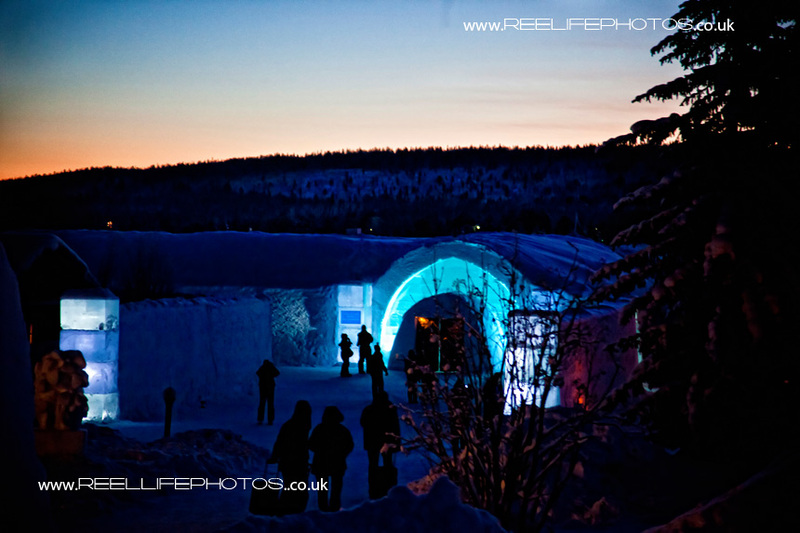 bridal party silhouetted outside the Ice Hotel entrance, ice glasses with hot lingonberry juice inside Absolut Ice Bar . 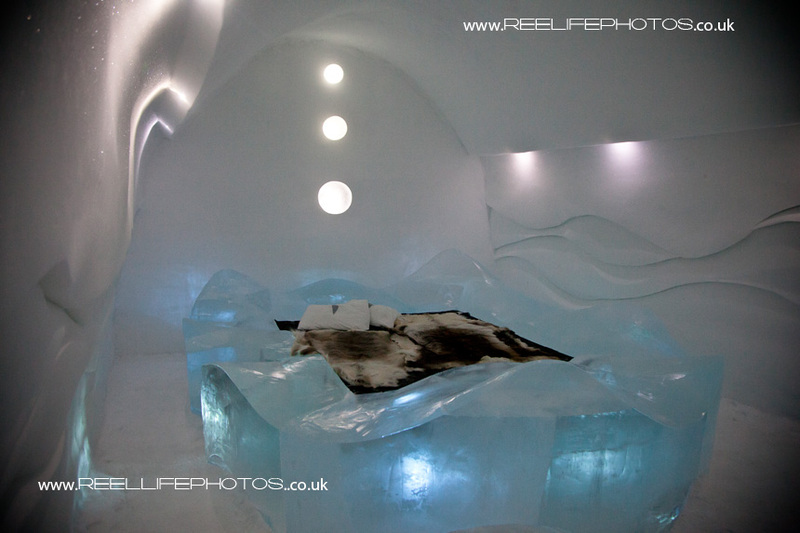 The Ice Hotel works its magic! 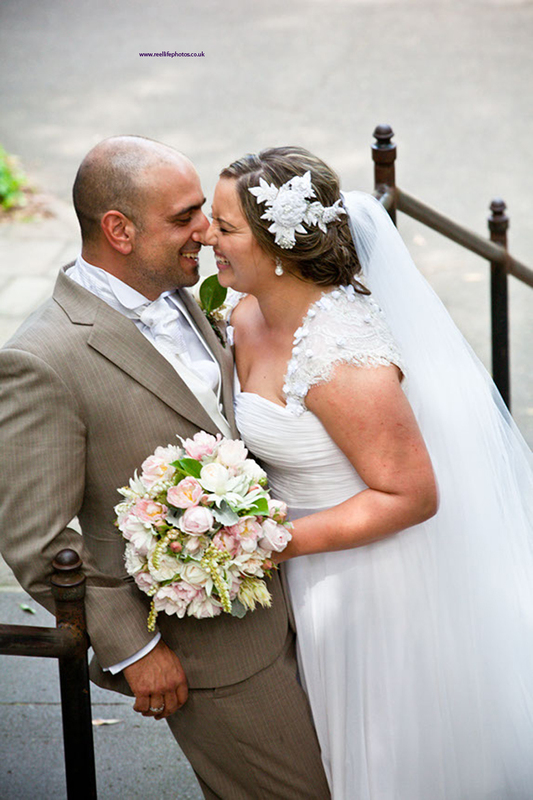 Zoe and her dashing groom Steve! 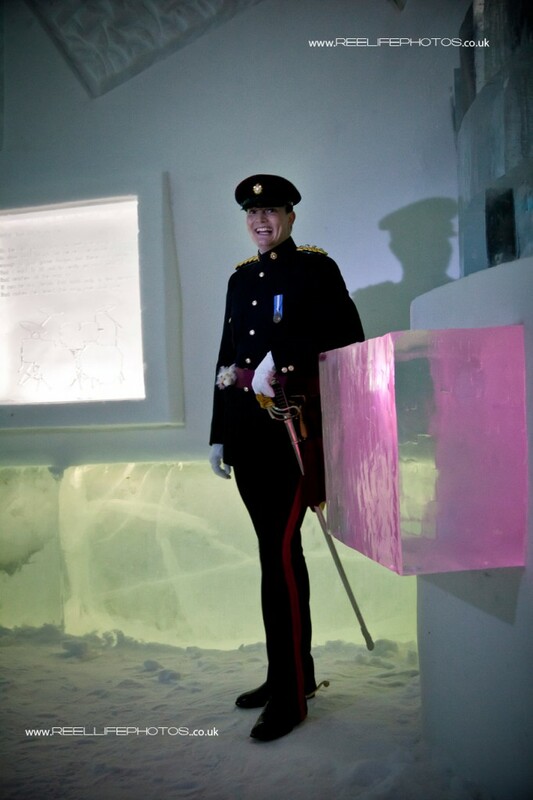 Just love the sheen on the clear ice, as it reflects the coloured light. Perfect for wedding pictures! 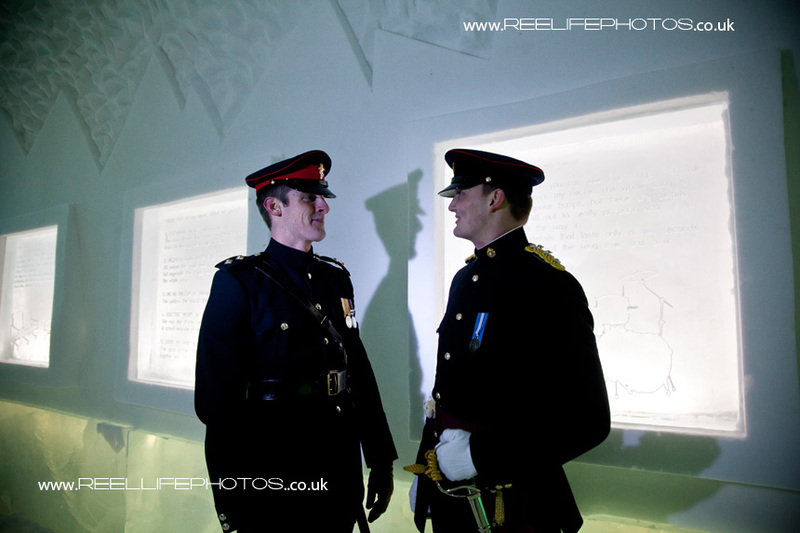 The guys look great in uniform too! 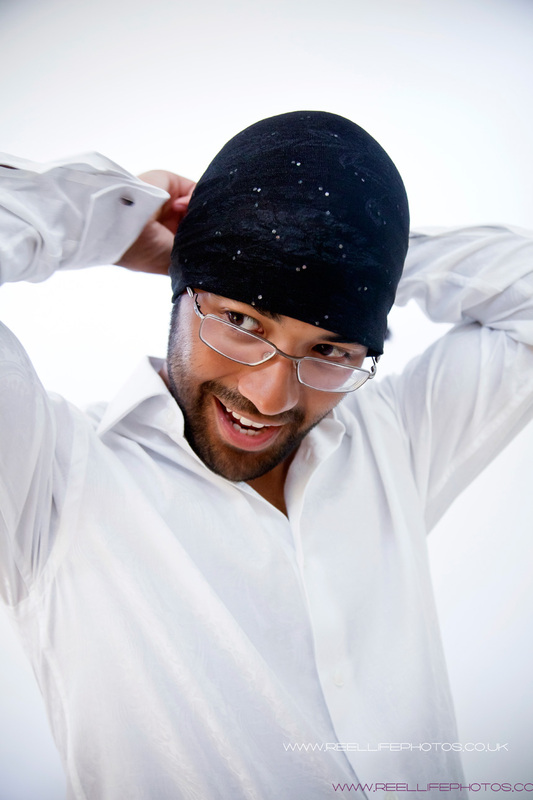 On the left there is a sequence of photos where everyone was throwing snowballs at Zoe & Steve. Love their expressions! 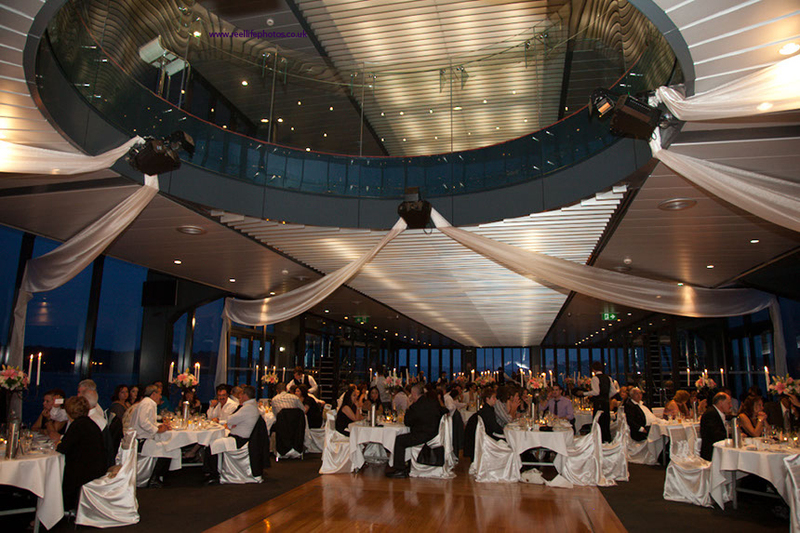 The picture on the bottom left shows Eva - who usually conducts the civil wedding ceremonies. She is just wonderful! 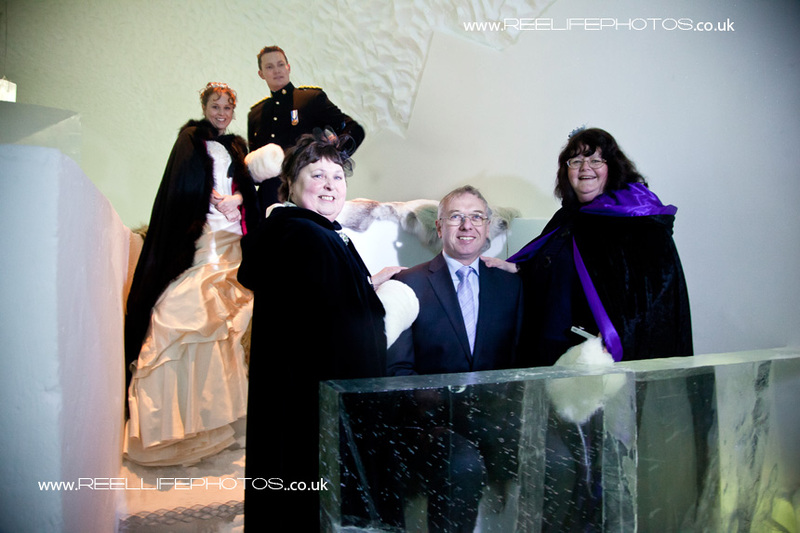 Just love the Sleeping Beauty pic in the polar bear art bedroom! 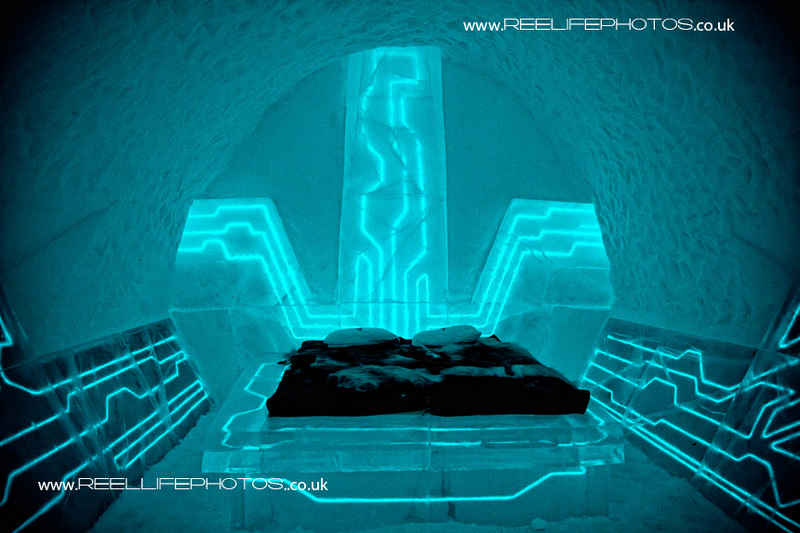 Even the blue colour makes me feel cold, but the atmosphere is electric! 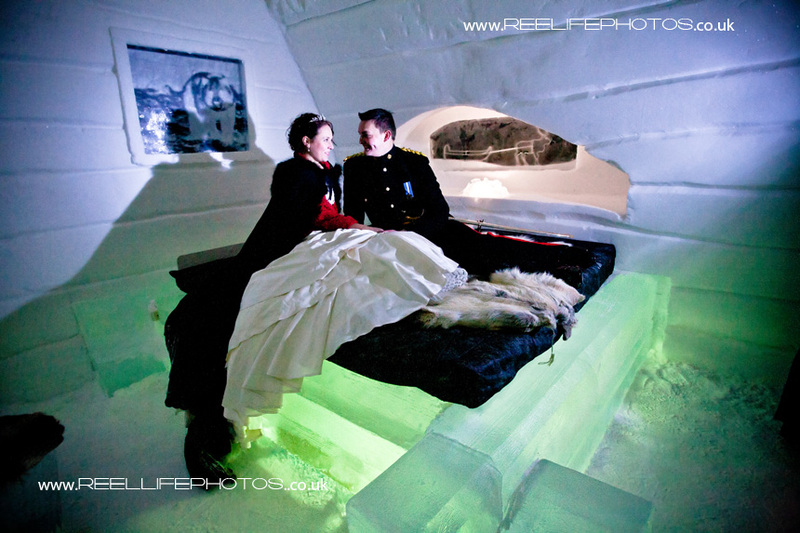 Moving speeches during the Ice Hotel wedding reception in the restaurant. 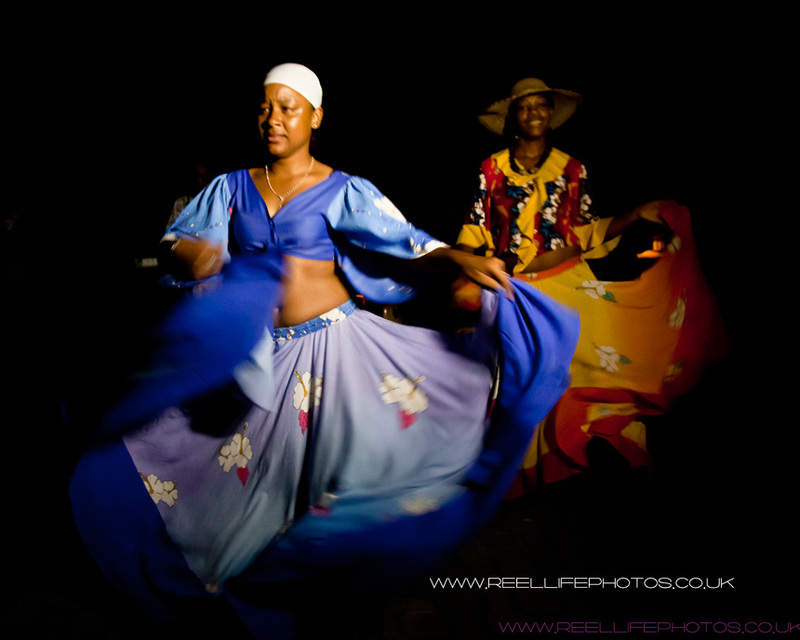 These Creole dancers performed in pitch black outside on the helipad by the sea at Lauren and Trevor’s Seychelles wedding reception. 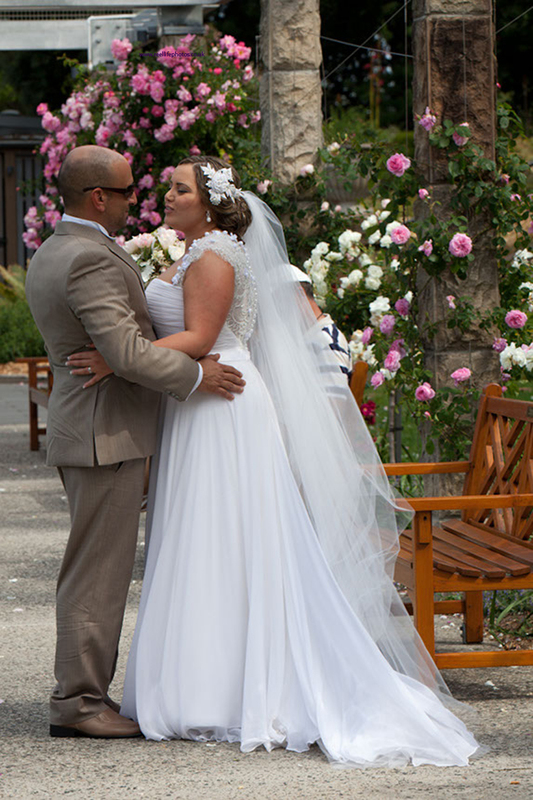 There was an official videographer there too (Michel T) , so this is just a basic clip I shot for myself (as the wedding photographer) on my Canon 5 D Mark II whilst also shooting photos. Levana – aged 9 and a half – was my little assistant using one of my “big” cameras and two different “L” (top of the range) lenses during the first part of this wedding, up to the end of the beach ceremony, and several of her photos have been included by the bride and groom in this storybook wedding album. 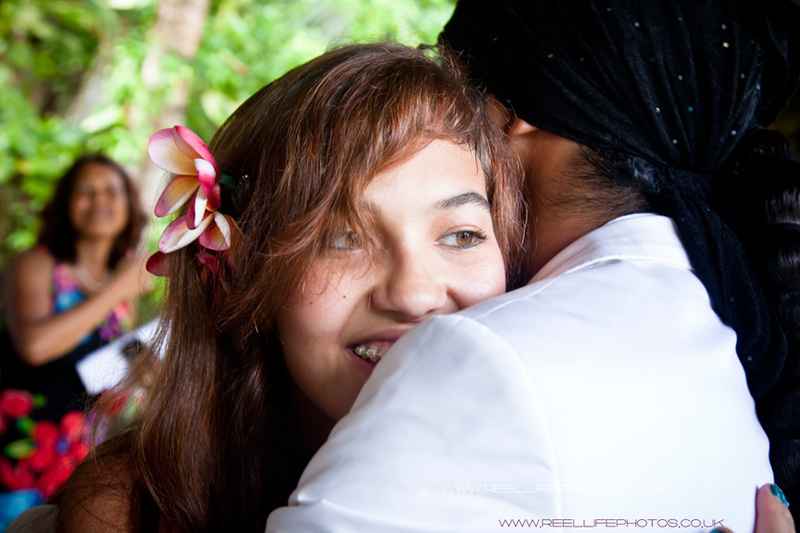 She has been coming with me on wedding shoots since she was three , so know what to do, though its only in the past two years she has been allowed to use one of my professional cameras to participate in the photography. 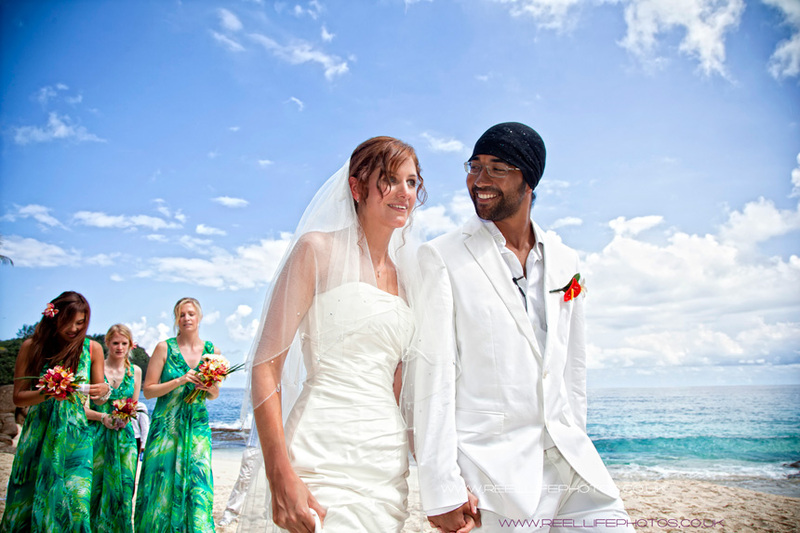 The earlier pages of this Italian storybook, showing the bride and groom and their families getting ready for the wedding, and Lauren & Trevor’s beach wedding ceremony in the Seychelles can be found here. 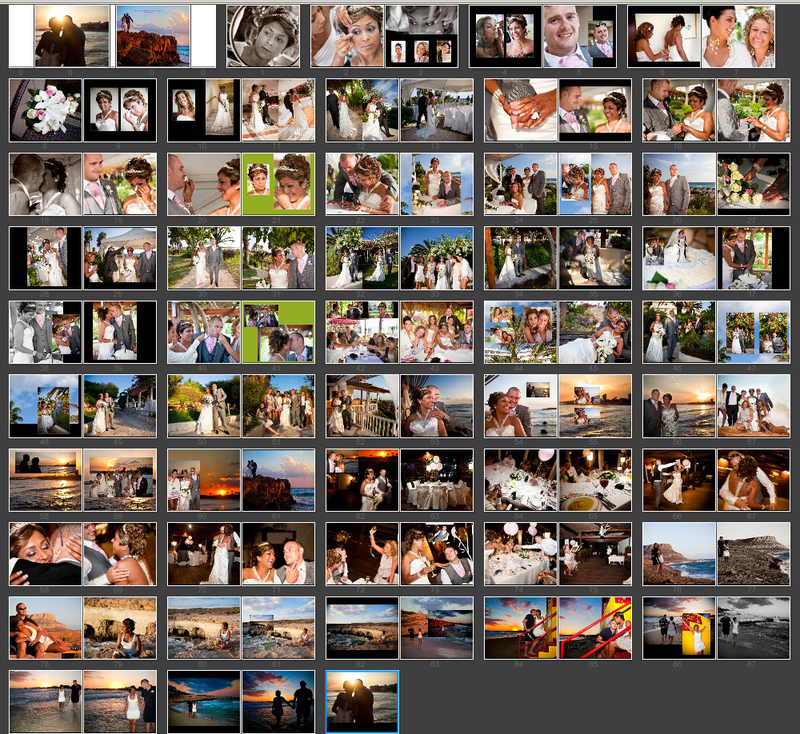 Sometimes I feel that wedding photographers are frightened of colour and dull everything down to muted tones and plain black and white throughout. 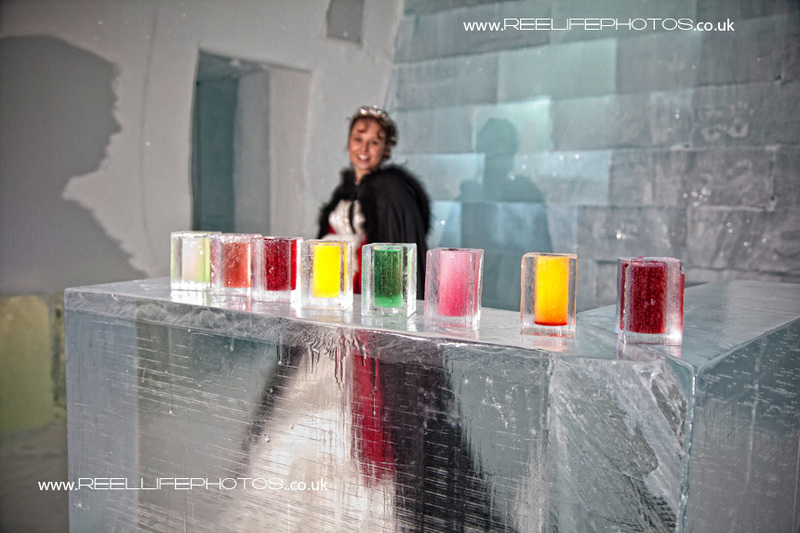 That might be appropriate for some weddings in the UK and for certain couple’s tastes, but when in an exotic or vibrant environment, its a shame to somehow avoid colour! Having lived in Greece for 8 years where I brought up my family, I soaked up the Mediterranean light which in turn formed my artistic vision through my oil paintings and line drawings of people, and photography too. 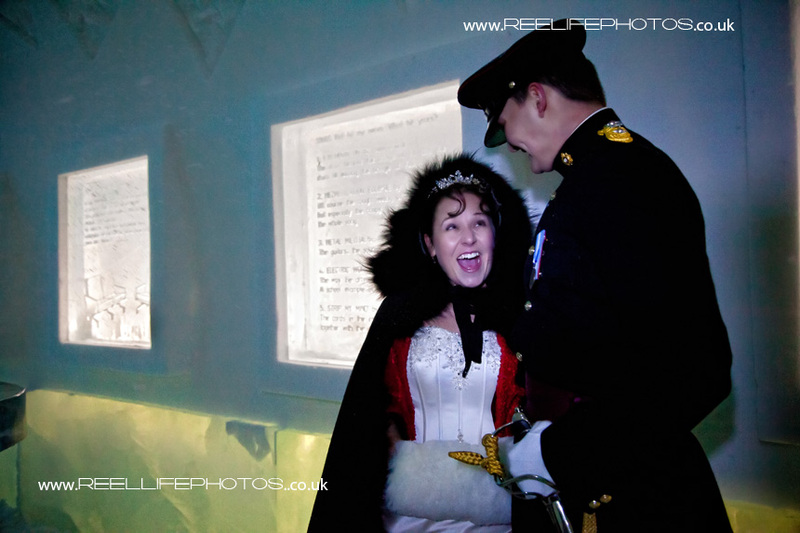 I doubt Kate and William had a better wedding than this, though they did honeymoon in the Seychelles too! The little pictures show details of the personalised coconut-shell cups the welcome drinks were served in decorated by star fruit. 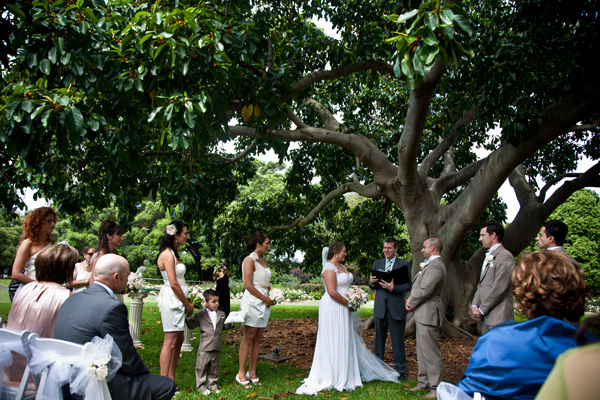 the tropical leaves overlaid with white Frangipani flowers following the theme of green dresses for the bridesmaids, and banana crisps wrapped in funnels of banana leaves. Absolutely fantastic! 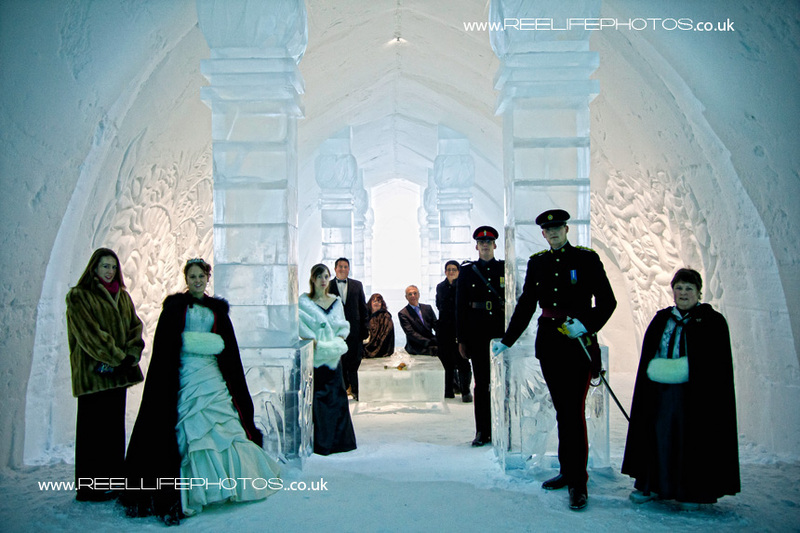 I originally designed these with the images of the bride and groom to the left and to the right in a slightly smaller size, as believe space surrounding the images is important to display the photos better, but always listen to bride and groom’s personal views and preferences so this is a revised version to suit their tastes. Love the emotional hug from the groom for his sister after the flute performance while their Mum applauds and smiles with happiness too. 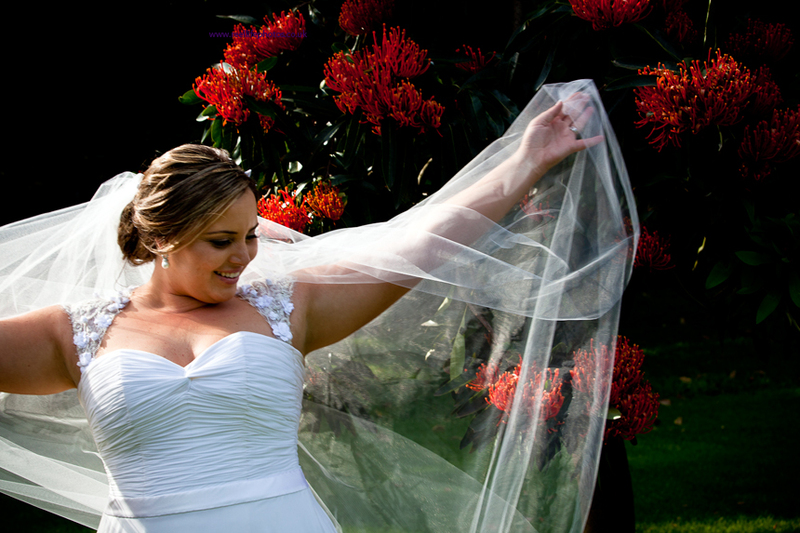 All the bridesmaids had Frangipani flowers in their hair too, so overlaid this lovely image of Katherine onto a picture of the red flowers used. 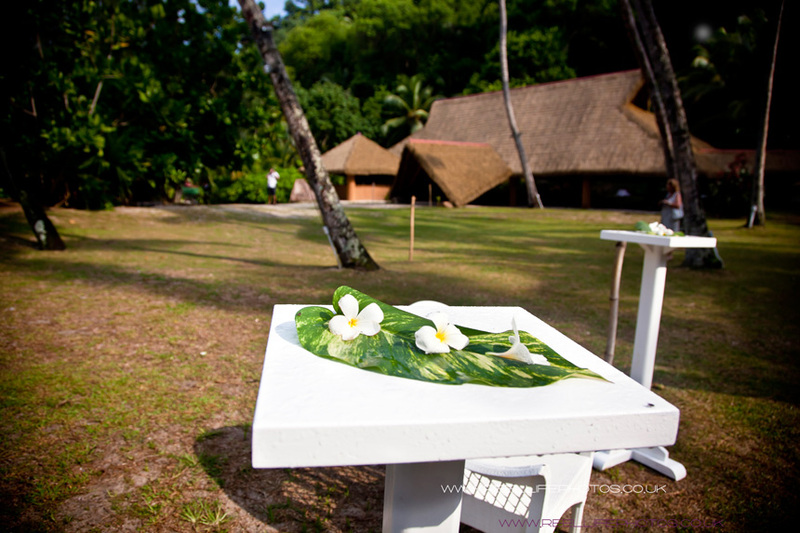 Seychelles wedding banquet! 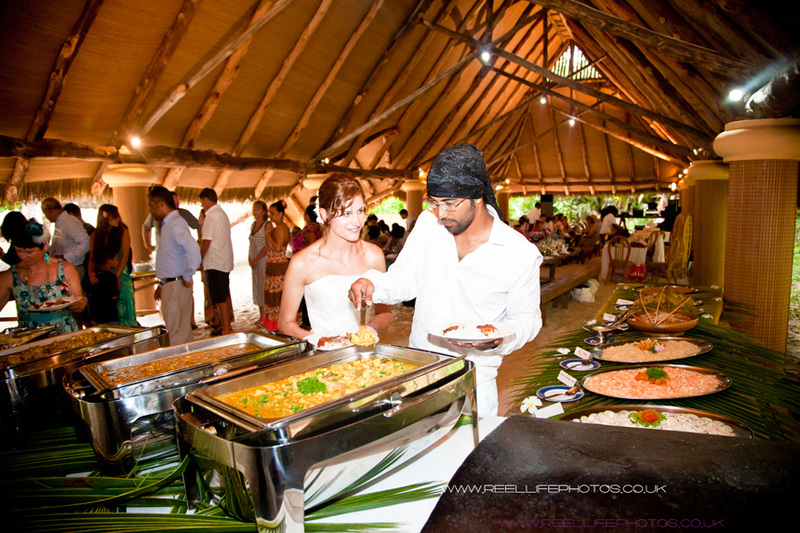 Exotic wedding food-yummie! 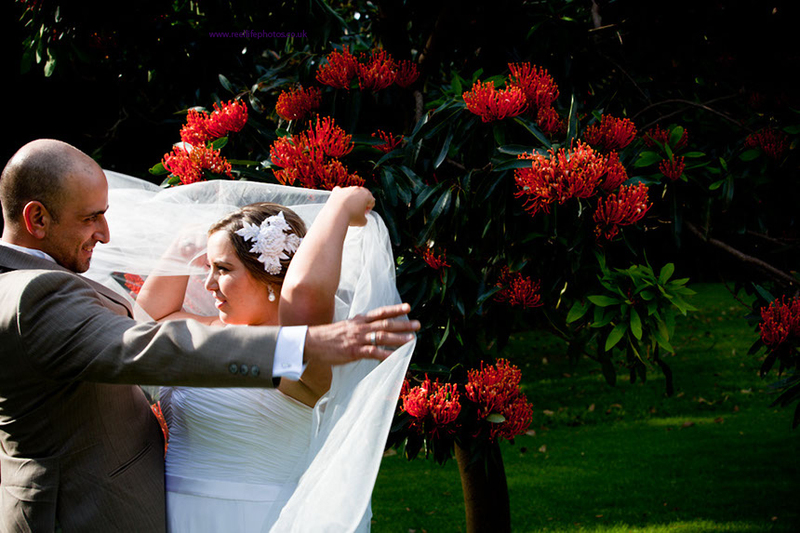 Nearly forgot to throw the bouquet! 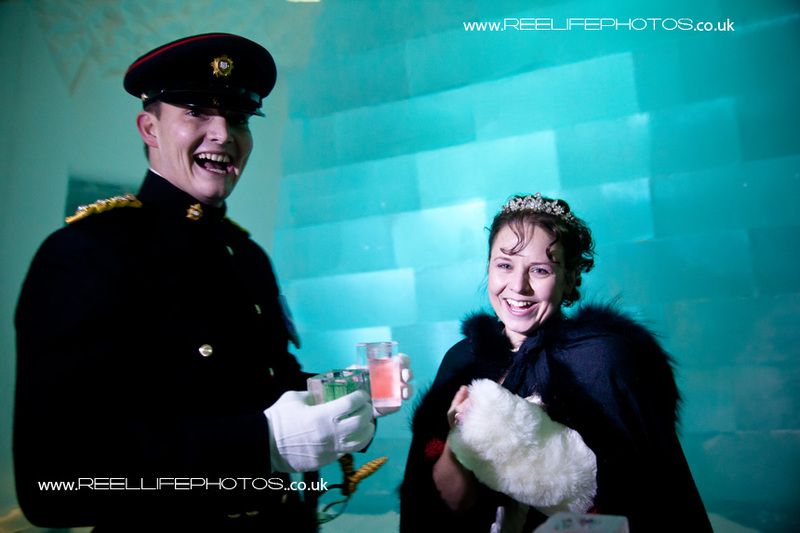 Lauren and Trevor found us on Facebook a year ago and clicked “Like” on Reel Life Photos Facebook Page. 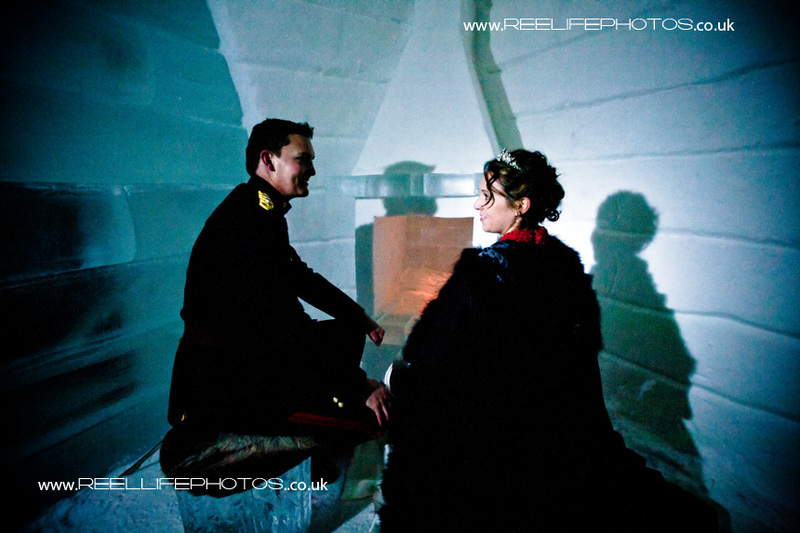 They are such a lovely couple I thoroughly enjoyed giving them a pre-wedding engagement portrait session in Sheffield. 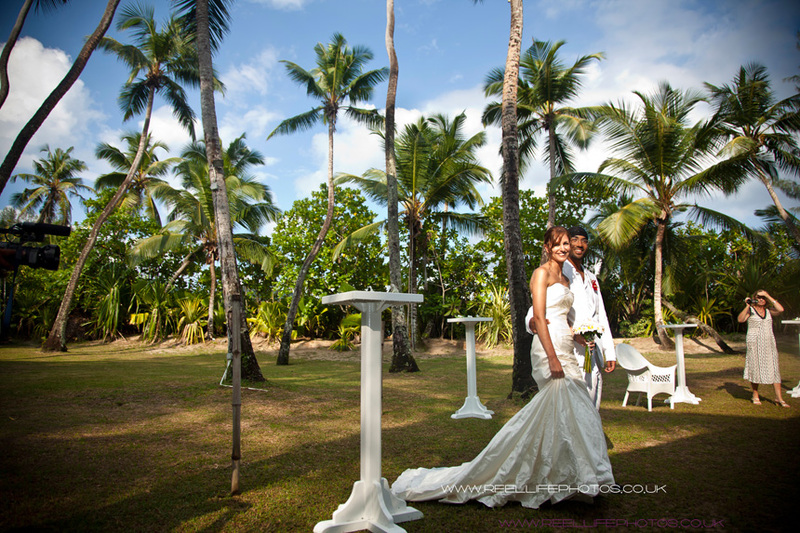 They had their honeymoon on one of the lovely islands in the Seychelles following their beach wedding on Mahe. 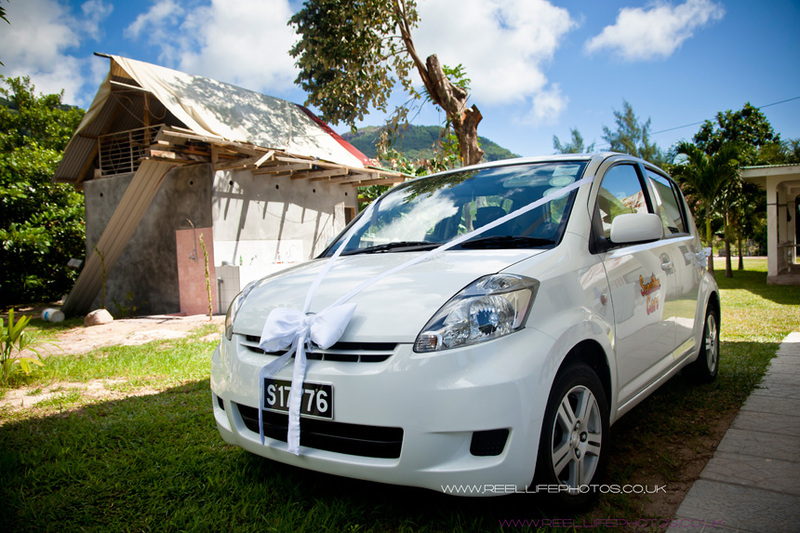 Little wedding photographer Levana and I both covered their Seychelles wedding and at the reception venue in Cap Lazare, we were joined by Damien, another young wedding photographer but from the Seychelles. 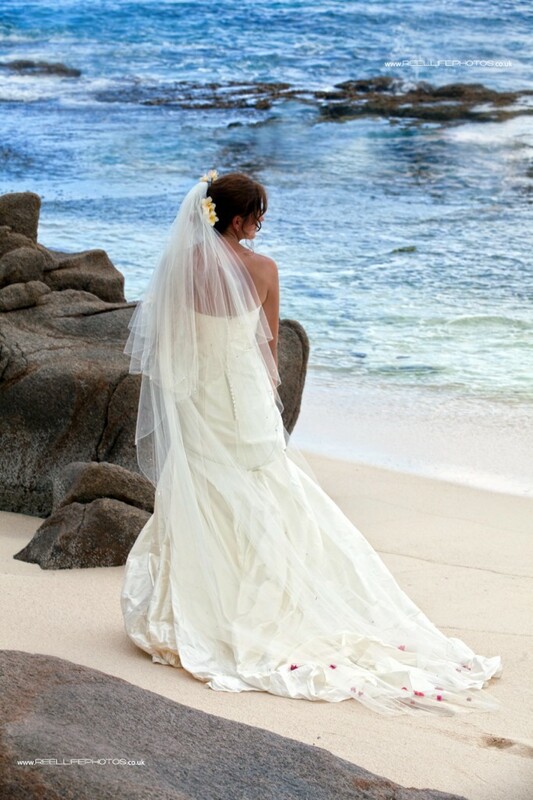 The couple chose to get married in the Seychelles as the groom’s family are all from there, and decided on April as it is usually the driest month. 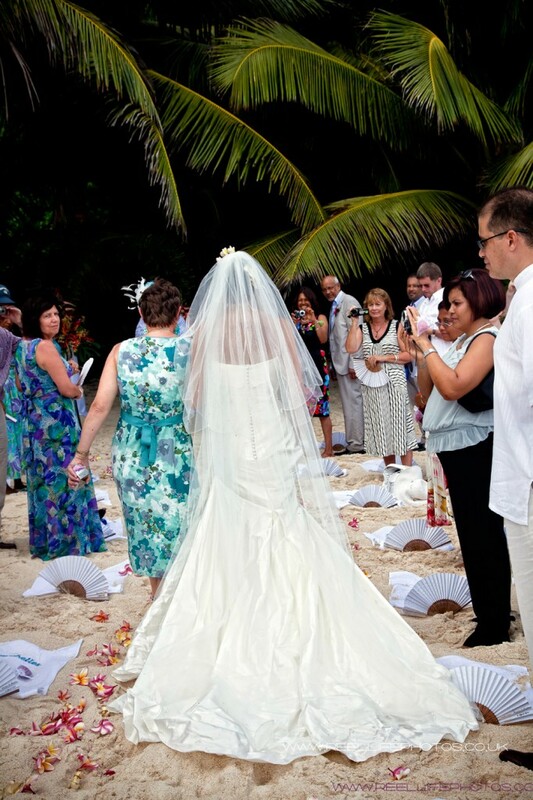 However on the wedding day, the beach wedding nearly didn’t happen as the clouds decided to to drop their load on the individually embroidered towels laid out on the beach with personalised white paper fans! The downpour stopped just long enough for the ceremony and a few pics before letting loose again with renewed vigour as we drove the half-hour’s ride to the wedding venue at Cap Lazare. 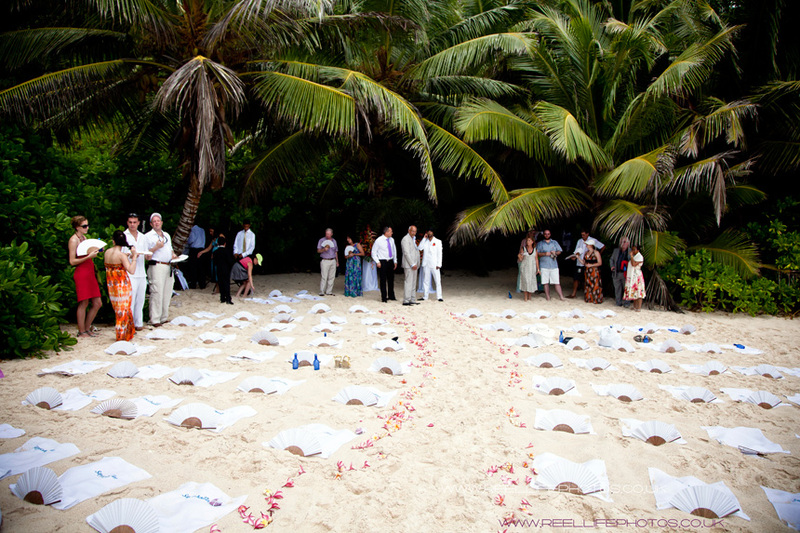 Guests shelter in the shade before the beach wedding ceremony starts. Novel location to sign the register…on a rock on the beach! 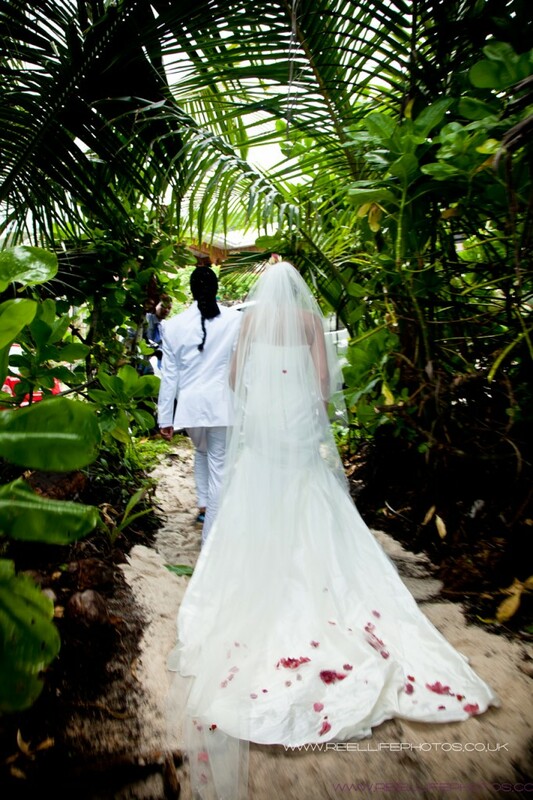 The dried flower confetti accentuates Lauren’s trailing silk wedding dress as she glides over the sand under a canopy of tropical trees. Paradise! 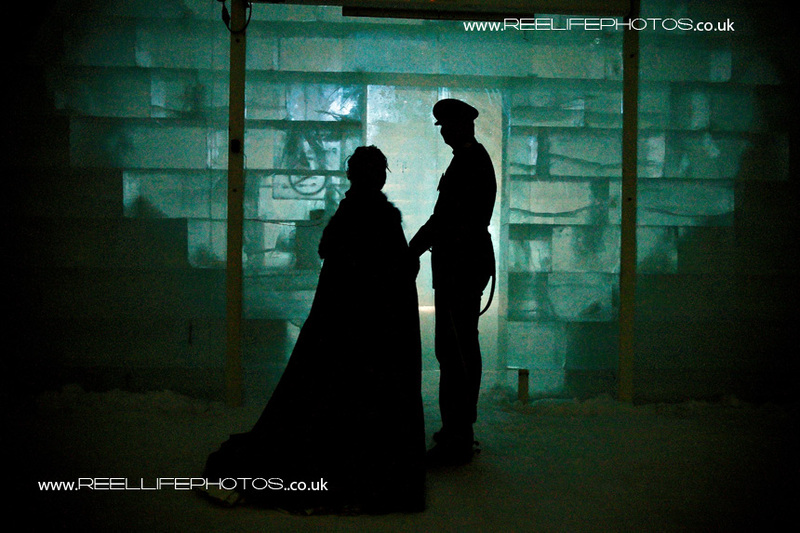 Wedding Ceremony in the Ice Chapel, Jukkasjarvi. 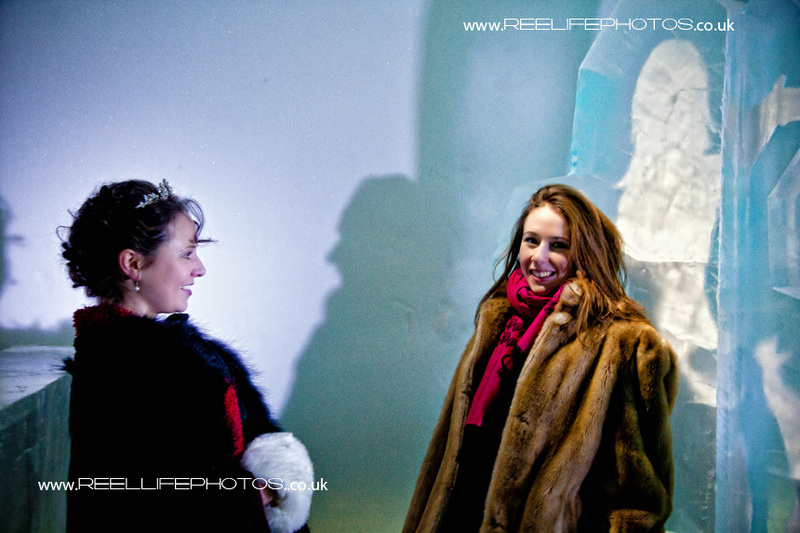 Braving the cold - minus 20 degrees! Its just adrenaline that is keeping Zoe warn! The bride arrives. Steve is SO happy! Zoe and her dashing groom Steve and photos with bride's Mum. 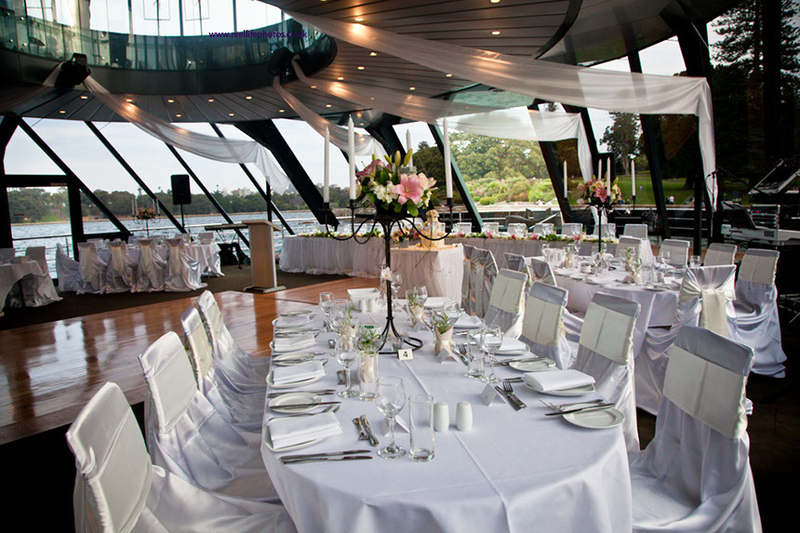 Zoe and Steve’s wedding venue in Sweden. 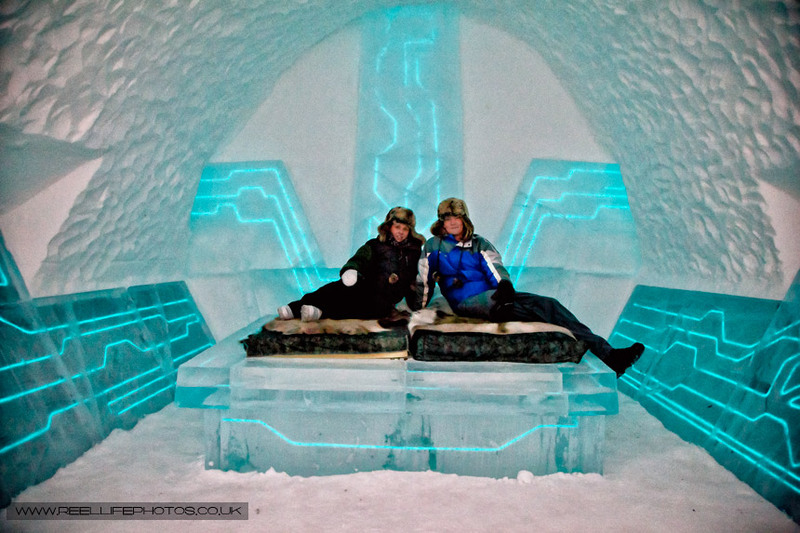 The Ice Hotel in Jukkasjarvi is a feat of engineering, creativity and solid determination. 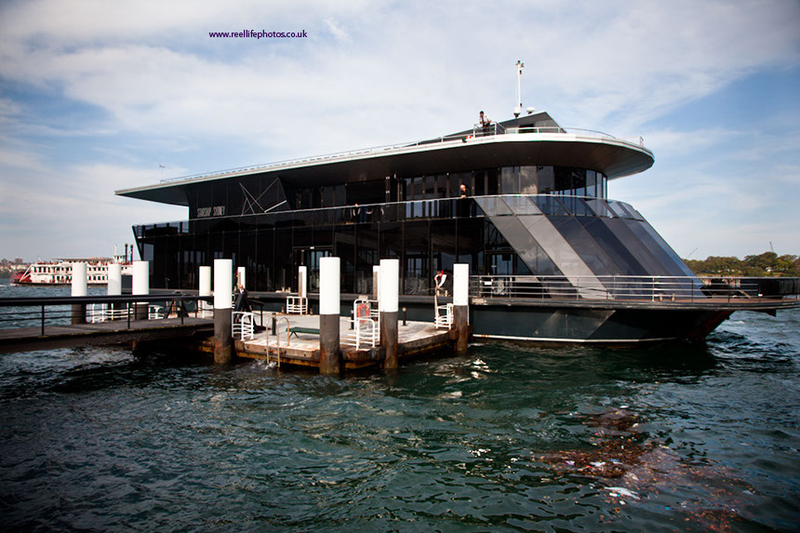 It glows out of the semi-darkness, attracting international visitors like moths to a flame. 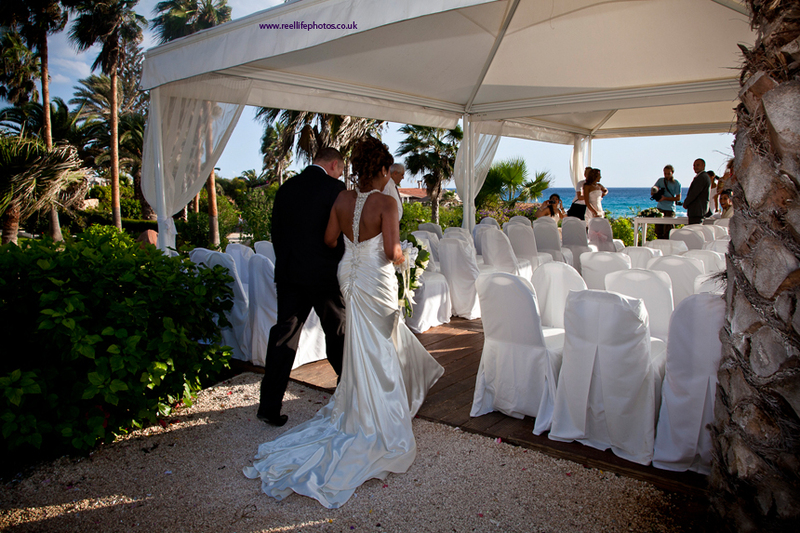 Despite the stormy sky at the start of the day, and the raindrops unloaded from the dark clouds at the beginning of the day, sun and romance were in the air in equal measures, at this beautiful couple’s wedding today at Nissi Beach in Cyprus. 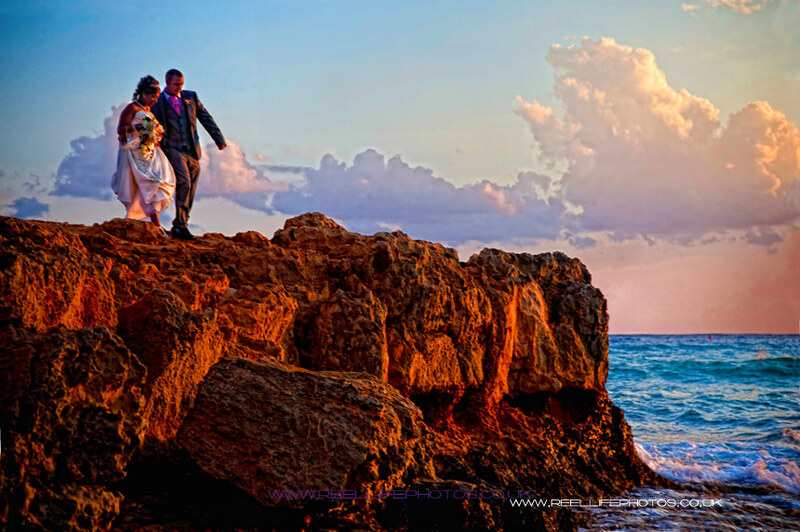 Their storybook wedding album included photos from a post wedding shoot along the beach, when the couple decided to change into cooler clothes, something well worth considering if you are getting married in Cyprus in the middle of the summer, as temperatures can be in the upper 30’s! Gambian “Boys” arrive at Sunset Beach Hotel for the wedding. 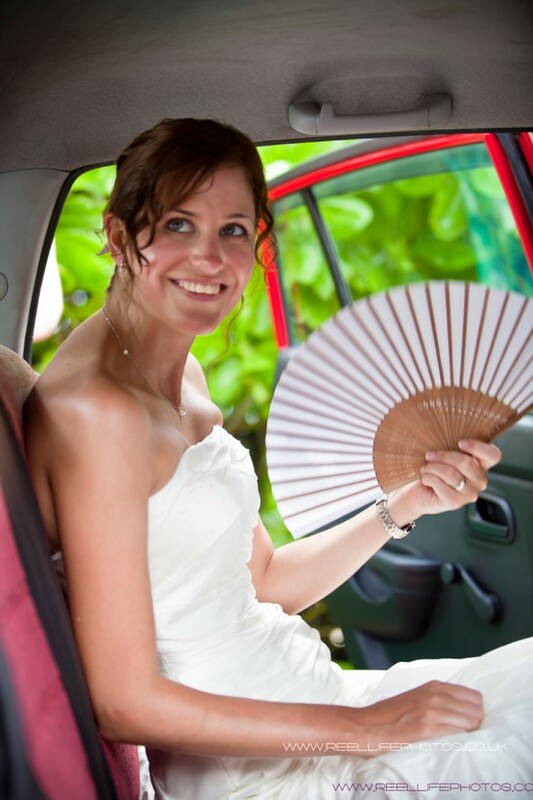 wedding cars in The Gambia! Gambian wedding celebrations at Denise and Bax’s compound. traditional Gambian wedding drink – mmm – delicious! 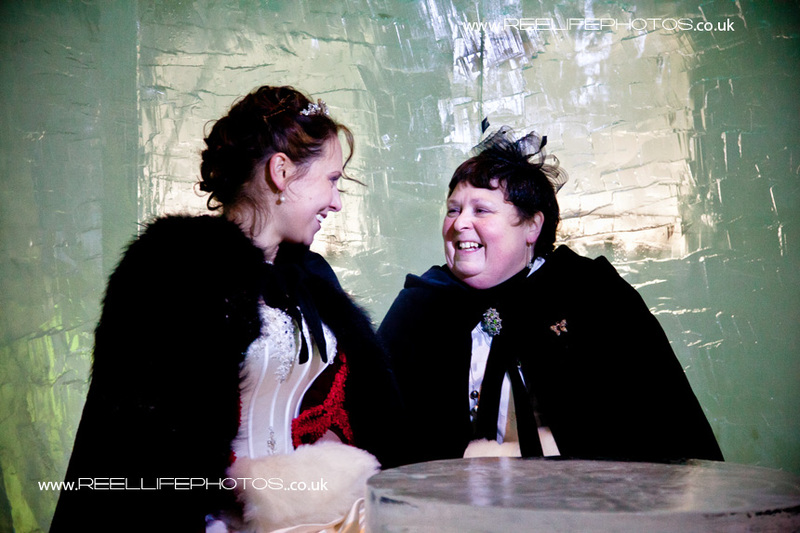 I wonder what the joke was… great fun anyway! More Gambian wedding dancing pics! New family united as one: lovely! 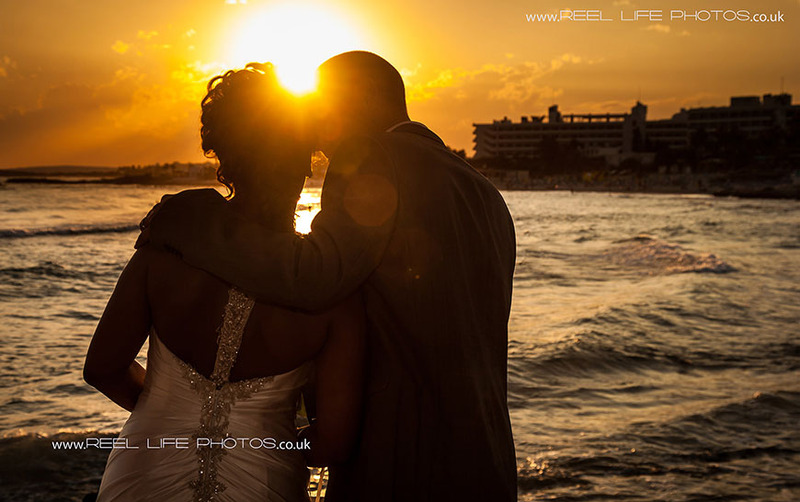 Since then we have been back in The Gambia for another wedding – this time at Coco Ocean Hotel for a UK based couple from Sierra Leone . 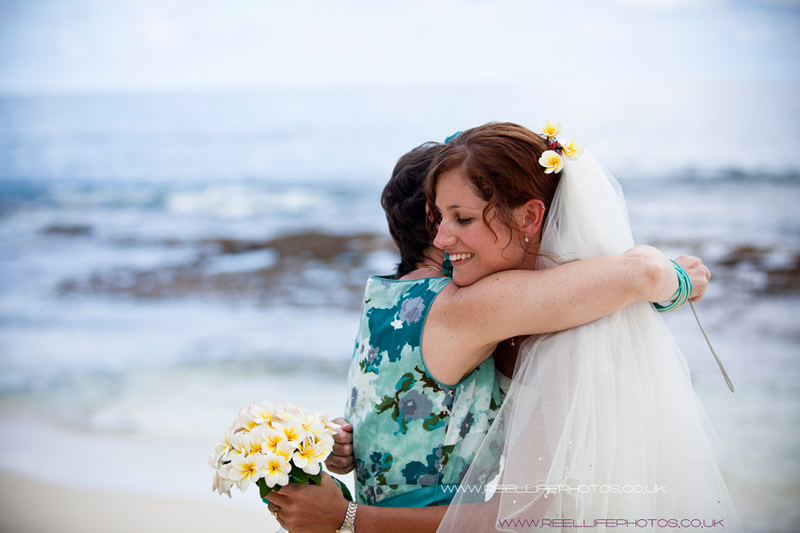 And we are back in Coco Ocean again now in December 2015 , for our 4th Gambian wedding this year alone! 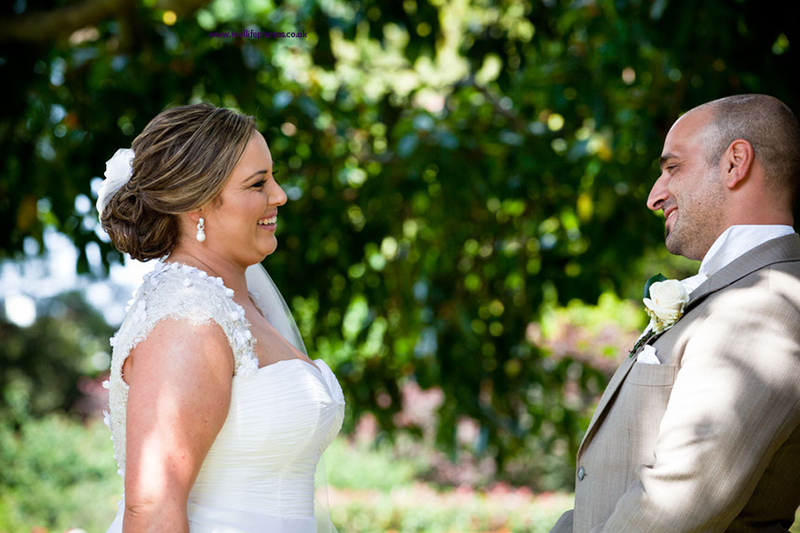 See more international weddings by wedding photographer Elaine !